DVD lovers! Today I bring you a high-quality DVD Ripper tool that can help you rip any DVD and convert it to the video formats you want in the fastest speed, for editing or playback on your devices such as latest iPhone, Android and much more! If you want to take your DVD movies with you on the road, or just want to copy main/full title content of DVD for backup, then WinX DVD Ripper Platinum can handle the job for you easily. I came across this DVD converter tool and found it a great tool for its ability to quickly and easily rip virtually any DVDs, including 99-title DVDs, scratched DVDs and workout DVDs. By selecting the preset output profiles for video formats and portable devices, you can backup your favorite DVD discs to ISO image/MPEG-2 file with lossless quality; convert DVD to MP4, AVI, TS, iPhone, iPad, Google, Windows devices, Sony, Xbox, etc. in one click. The best part is, with the support for Intel QSV and NVIDIA (CUDA) NVENC based Hardware Acceleration, etc. technologies, WinX DVD Ripper Platinum increases your DVD ripping speed impressively. And you’re able to adjust it depending on your situation. WinX DVD Ripper Platinum is widely-known DVD ripping software developed by Digiarty Software, and the tool is frequently updated to support new DVDs and technologies. With 11 years of experience in the industry, Digiarty is now a leader in personal and home-use video audio applications based on Windows and macOS. It provides fast and easy-to-use DVD ripper/copier/creator, video converter, online video downloader, media player, iPhone file manager, video audio streaming app, etc. WinX DVD Ripper Platinum is available for both Windows and Mac operating system. In this post, I will fully review WinX DVD Ripper Platinum on Windows and I will guide you how to rip a DVD to the video formats. This DVD Ripping software easily reads all kinds of commercial/homemade DVDs with seconds. Then you just select your device profiles, such as iPhone 7/7Plus, Samsung, Huawei, Microsoft WP8, etc. or choose Web Video profiles like YouTube, Facebook. To boot, you can rip to MP3, AAC music as you like. It has built-in 350+ profiles for you! It’s impressive that you can copy your DVD in 4 unique modes with WinX DVD Ripper Platinum. Clone DVD to ISO image, DVD to a folder at 1:1 ratio. Backup DVD main title or full title content with all videos/audios/subtitles. You’re able to enjoy the output DVD video with lossless quality. WinX enables you to utilize hardware acceleration to speed up DVD ripping process. You can also set Multi-core CPU (up to 8 cores) and use Hyperthreading technologies to enjoy the blazingly fast speed. You just set the output format, run it, and then the software will process it for you automatically. Supported Output: General Formats: Built with 320+ Video/Audio Codecs, support AVI, MP4/H.264, MOV, AVC, MPEG, WMV, MTS, M2TS, TS, MPEG4, FLV, M4V, ISO image, DVD folder, MPEG2 (DVD), Chromecast, etc. Portable Devices: Apple (iPhone, iPad, Apple TV, iTunes, etc. ); Android Mobile/Pad (HTC, Samsung Galaxy, Huawei, etc. ); Microsoft (WP8, Nokia, XBOX, etc. ); Sony (PSP, PS4, etc.) and other devices. How to Rip DVD to the Format You Want? 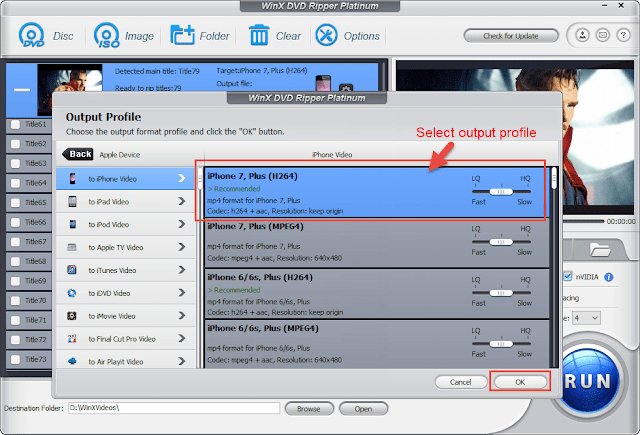 Here are some simple steps for you to rip your DVD to the format you want using WinX DVD Ripper Platinum. To get started with the software, you first need to download and install in on your computer. Launch WinX DVD Ripper Platinum, click “Disc” icon to select your DVD disc, and click OK to load the DVD content. ISO Image and DVD folder are also available to be ripped. After loading, all DVD titles will be listed and the main titles will be automatically detected. Meanwhile, the output profile window pops out. Then you can select the profile type and choose your device or format. Here I choose iPhone 7 as an example, so I just need to click “Apple device”, select the recommended iPhone 7 profile, and click “OK”. Step 3: “RUN” it and it’s done! Just click the “RUN” button and the ripper will start the process for you! Besides, you can make personal settings as you wish. Click the “Edit” button for the main title and you can trim to make a video clip. Crop and cut off unwanted area of the movie, and add external subtitles. Also, you can set tag info and change the destination folder. WinX DVD Ripper Platinum impressed me for its powerful and fast speed. It tackles DVD ripping effortlessly and makes the steps simple. Just in 3 steps, you can get your DVD movies digital formats and enjoy them on your device. Now download WinX DVD Ripper Platinum to rip/backup your own DVDs easily!